After the hand-farting TMNT theme, I owe you guys something soul-cleansingly adorbz, right? Well, don’t say I never gave you anything besides a nervous tick. 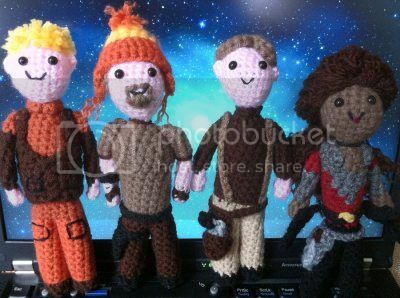 These Firefly amigurumi dolls were hand-crocheted by deviantART user Smapte and Redditor for the pleasure of your eyeballs. And, yes, we all would have been satisfied with just a decapitated Jayne amigurumi doll wearing a little hat. But you get more. So there.